An immersive day of yoga; a retreat in which you don't have to leave the city! Practice will consist of vinyasa and restorative yoga class, philosophical discussion, simple breathing exercises, as well as an approachable bit of time in stillness and silence. No experience is necessary, only a willingness to explore. Bring a light lunch or feel free to visit one of the few eateries in the neighborhood during a short midday break. 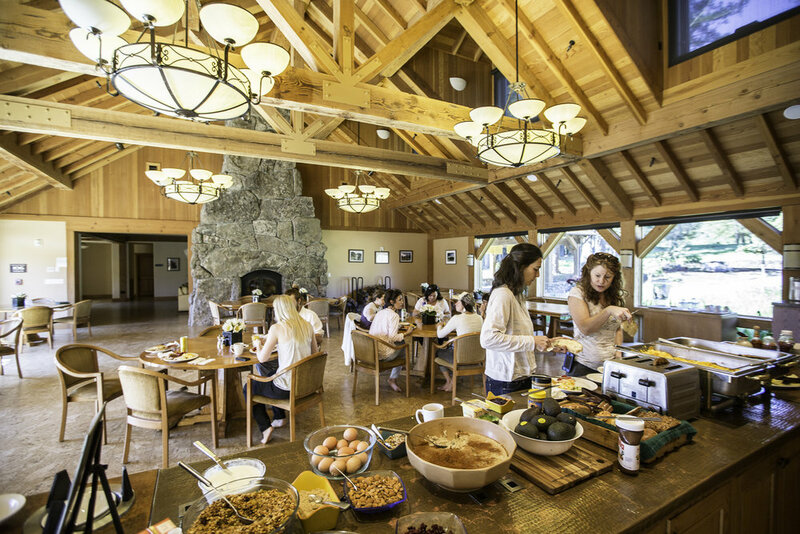 This Spring was so fun we’re doing it again: a perfect two-night retreat in Northern California!… At the breathtaking Ratna Ling Retreat Center in Cazadero, 90 miles from SF. This place is unreal. Private rooms in luxurious cottages, nestled in the woods just minutes from HWY 1 and the Pacific Ocean. Friday-Sunday. We sold out six weeks ahead of the event last year, so don’t delay! Each cottage has TWO private bedrooms with one queen bed in each room. All have a shared bathroom and common area. They are beautiful and plush and spacious. All yoga, food and accommodations are included. 4 Yoga Classes + Discussion, lecture, sitting practice, etc. Every time we lose our temper at a loved one, every time we absent-mindedly forget to turn off the stove or reply to an email... every instance in which we falter in showing up with the skill we know we posses is due to one reason: a lapse in the continuity of attention. Yoga is the process by which we learn to maintain that continuity for longer and longer periods of time. The greatest gift offered by the practice is the ability to stay awake, engaged, and participatory during more and more of the moments of life. This is especially powerful, and enjoyable, in a retreat setting. This weekend retreat will focus on the baseline awareness that can accompany all things from eating to walking to stretching to conversing to relaxing. And we’ll certainly enjoy all such things in abundance! The food is impeccable, the surroundings are stunning, but the company will be the best part! Yoga, Northern Lights, Hot Springs, Glaciers. Icelanders will tell you that winter is the most breathtaking time to visit their awe-inspiring country. The beauty of Iceland is not only found in its raw otherworldly nature, but in the unique and creative culture that bleeds out of Reykjavik. We will spend one night at the BlueLagoon, three days in Reykjavik and then chase the northern lights and and hot springs in the North! The best thing about handstand is that its precariousness forces one to pay close attention to what they’re doing; it’s a pose that tricks a person into presence. The second best thing about handstand is that it’s a factory of feeling; the body glimmers with life. The third best thing about handstand is that it breeds structural integrity; the fundamentals of alignment create a sense of continuity in the body. The fourth best thing about handstand is that, if you can do it, you’re basically enlightened and immortal and can be on the cover of various esteemed periodicals. An immersive day of yoga practice; a retreat in which you don't have to leave the city, this time including a wonderful catered lunch! The morning will consist of vinyasa yoga practice and philosophical discussion. The afternoon will start with restorative yoga and then alternate between periods of sitting and walking meditation. It's okay—don't freak out! The seated periods will be arranged in a supportive and approachable manner. No meditation experience is necessary—only a willingness to explore. Success in life is demonstrated through relationship and creativity. The people with whom we connect and the things we create lead directly to the overarching sense of meaning we get from living. Yoga is the technology of connection and creation. This afternoon workshop will consist of lecture, vinyasa and restorative yoga, as well as sitting practice. It will provide a penetrating look at the various ways in which yoga invites a person to develop the traits and temperaments that allow for success in the art of living. An immersive day of yoga practice; a retreat in which you don't have to leave the city. The morning period will consist of vinyasa yoga practice and philosophical discussion. The afternoon will be silent and consist of alternating periods of sitting and walking meditation. This Patagonia Yoga Retreat and Eco-Adventure is truly an adventurers fantasy: kayaking on the Grey River, exploring the ancient caves of Mildon, navigating through Southern patagonia’s glaciers by sailboat, biking amidst the exotic flora and fauna of Laguna Azul park, hiking to one of world’s most famous views overlooking the famous Torres del Paine National Park to feast and revel in the overwhelming beauty of the three gigantic granite monoliths created by the forces of glacial ice. We’ll rest from our daily adventures at Ecocamp Patagonia, where groundbreaking sustainable building design allows for sumptuous comfort and total immersion in the surrounding wilderness simultaneously. Pairing grounding yoga practices with the one-of-a-kind potential for adventure in nature that Patagonia offers will leave you completely rebalanced and re-energized. More info or sign up! BKS Iyengar once said that as yogis, "Our specific field of exploration is ourselves, from the skin to the soul…” Our culture has passionately embraced the practice of asana - this workshop intends to give depth and breadth to the experience of being a practitioner. Join Gina Caputo, Jason Bowman and Nicolai Bachman for a weekend of inquiry and illumination of our inner landscape through meditation, asana and mantra. On this yoga retreat in Moab you will wake up every morning to cool desert air, a bright red sunrise, and an energizing yoga practice to get your body ready for the day ahead. Your days will be filled with amazing yoga flows, rock climbing, mountain biking, hiking, and other optional activities like bouldering, trail running and rafting. After a full day of adventuring around the land and within yourself, you will return to our river-side camp site for a gourmet dinner, relaxing sunset yoga practice, and lots of laughing around the campfire. Our advanced Philosophy and Meditation program begins by strengthening the foundation that you developed in your basic certification. Whether you received your 200-hour certification at Yoga Tree or another Yoga Alliance compliant school, our Advanced Philosophy and Meditation program is designed to take your existing knowledge and skills to the next level. Taught by Yoga Tree’s most senior teachers, this program offers advanced studies and teaching skills in the Classics of Yoga, Sanskrit, Meditation, and the Practical Philosophy of the Subtle Body. Every day of the training is a practice of embodying scholarship; blending theory and practice for a complete experience. The Yoga Tree Advanced 500-Hour Certification Program will provide you with the skills you need to flourish as a teacher while qualifying you for membership in the Yoga Alliance at the 500 RYT level. The Advanced Certification is broken down into 8 majors consisting of Core Studies and Electives totaling more than 300 hours of hands on training. Because our electives are broken down into categories, you will graduate from our program as a highly specialized yoga teacher uniquely qualified to work with the students you feel drawn to serve. The cost of the program depends upon what you choose as your electives. There are opportunities to study with a mentor or do a karma yoga project, more information is listed below. The overall cost ranges from $4,000-$4,500. All course work, starting with your first course (rather than the date you are accepted) must be completed within three years. At the root of vinyasa yoga is the Ashtanga method developed by S.T. Krishnamacharya and Pattabhi Jois. This tradition gave birth to many of the sequences, themes, transitions and poses of modern yoga. In its detail and rigor blossoms a rhythmic moving meditation. A grounded experience of the history of Vinyasa Yoga provides a powerful set of tools to bring to your practice and your classes. This intensive focuses on the fundamentals of Ashtanga yoga through the exploration of the Primary Series, called Yoga Chitiksa (Yoga Therapy). Sun salutations, standing poses, seated poses, backbends and finishing sequences will be taught in their traditional forms with attention to subtlety and room for questions and demonstrations. Come experience the system that helped to start it all! The internal yoga practice weekend training at The Lokha Resort in Ubud, Bali. Saturday and Sunday at Bliss Yoga Jakarta, Indonesia.